CORONADO — Coronado Mayor Casey Tanaka unsuccessfully ran for Seat 3 on the Southwestern Community College District Board of Trustees in the Nov. 8 election, finishing third out of five candidates. As of Nov. 30, Roberto Alcantar, district director for State Sen. Marty Block, won with 56,738 votes (39.05 percent), followed by Army and Marine Corps veteran William McLeroy with 35,818 (25.34 percent), Tanaka with 28,006 (19.27 percent), Lei-Chala Wilson, legal advisor to the San Diego Black Police Officers Association, with 14,691 (10.11 percent), and Lander Iriarte, whose background is in finance, with 9,052 (6.23 percent). About 18,000 absentee and provisional ballots remain to be counted, but the outcome is not expected to change. Tanaka said in his candidate’s statement, “I was born in Honolulu in 1976 and moved to Coronado in 1983. I attended public schools in Coronado from 2nd-12th grades and then went to UCSD, where I was awarded a BA with honors in history and a minor in political science in 1997. I started teaching AP U.S. history in Coronado in 1999 and have been teaching at my alma mater ever since. “In 2000, at the age of 24, I ran unsuccessfully for the Coronado City Council. Two years later in 2002, I decided to give it one more try and I won a council seat. I was re-elected in 2006 and in 2008, I was elected Coronado’s mayor. I was re-elected mayor in 2012 and because of term limits, I will be stepping down as mayor in December of 2016. “I want to apply the expertise that I’ve accumulated as a classroom teacher and civic leader toward empowering students and adults in the South Bay. I am excited about the many great things going on at Southwestern College and I want to do my part to improve and protect this institution for our citizenry and for her future generations to come. 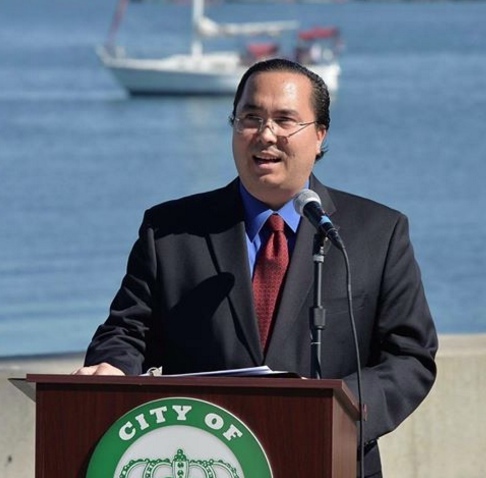 Tanaka will be succeeded as mayor by Richard Bailey, who said in a statement, “I would … like to thank Mayor Casey Tanaka for his 14 years of service on the City Council – six as a councilmember and eight as mayor. Mr. Tanaka was able to lead the City Council in a manner that fostered a professional, constructive and respectful dialogue, while utilizing the respective strengths of each councilmember to arrive at decisions that created a better Coronado. “One of the characteristics I admire most about Mayor Tanaka is his modesty. On the few occasions where the council made a ‘wrong’ decision, he never passed the responsibility on to the entire council, even though it was a collective decision, he would simply accept the criticism and make the necessary adjustments. But whenever someone gave praise for a job well-done, Mayor Tanaka was the first to say the credit belongs to the city staff and City Council, often shirking praise that he had rightfully earned.